STATE QUALIFIERS — Students representing Boone Central in the State Speech Tournament on March 23 are (l.-r.) Walker Stuhr, Mariah Olson, Olivia Groeteke, Patricia Cleveland and Scott Wright. Boone Central’s speech team earned fourth place in the C1-3 District Speech Meet on Wednesday, Dec. 15, at Wayne State College. 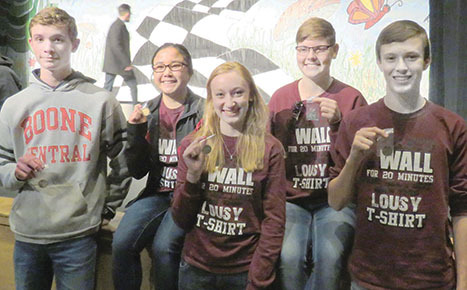 Five Cardinal speakers placed in the top three in their events, earning a trip to compete in the C1 State Tournament this Thursday, March 23, at the University of Nebraska at Kearney. District medalists and state qualifiers were Mariah Olson, champion in poetry; Olivia Groeteke, third place in poetry; Tricia Cleveland, second place in serious prose; Walker Stuhr, third in entertainment speaking, and Scott Wright, third in extemporaneous speaking. Others placing in the district meet, but not qualifying for state, were Trey Zoucha, fifth in serious prose; Thomas Hosford and Sydney Wynn, sixth in duet acting. Also placing sixth was the oral interpretation of drama team of Trey Zoucha, Abby Mousel, Ashley Mewhirter, Julia Spann, and Stephanie Wright. Pierce won first place in the nine-team district meet, while Battle Creek was second, Twin River third, and Boone Central fourth.